Just enter an email address you can check on your iPhone or iPad, and it’ll send the OPML file as an attachment to that address. 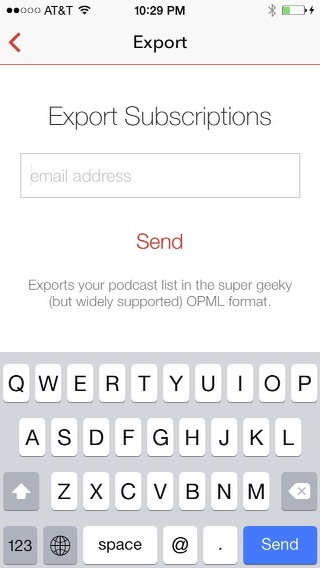 Open the message on your device, click on the attachment, and then use the “send to” feature (the little box with an arrow pointing up) to send the list to your new podcasting app. On an android device, you might need to first save the file to your phone’s internal storage, then open it in the new app. 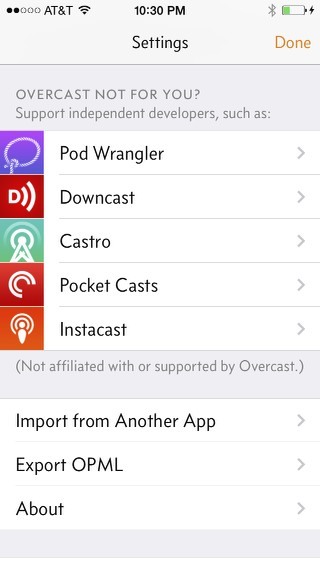 Downcast for iOS makes things a little easier. Click on the “More” button at the bottom of the home screen, then click on “Tools.” Select “Export Feeds to OPML” and you’ll see the option to send the file directly to a different application, no email required (unless you really want to use email). Overcast makes things even simpler. In Settings, click on “Export OPML” and a list of compatible apps will automatically come up. 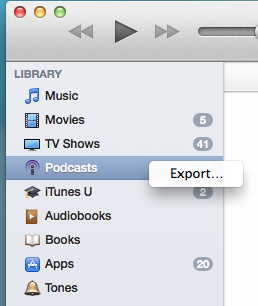 If you’ve been using iTunes to subscribe to Podcasts, you’re in luck. Control-click on the “Podcasts” item in your sidebar (if the sidebar isn’t visible, you can unhide it from the View menu), and an “Export” button will appear. 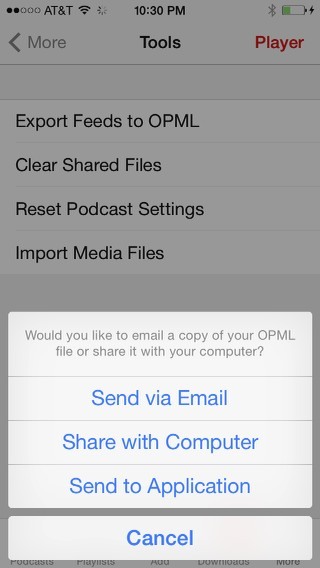 Select OPML as your file format and email it to your device. A cursory internet search reveals that a lot of popular podcast apps support OPML, so if you’re switching apps and you’ve got A LOT of subscriptions to re-subscribe to, do take advantage of this convenience. 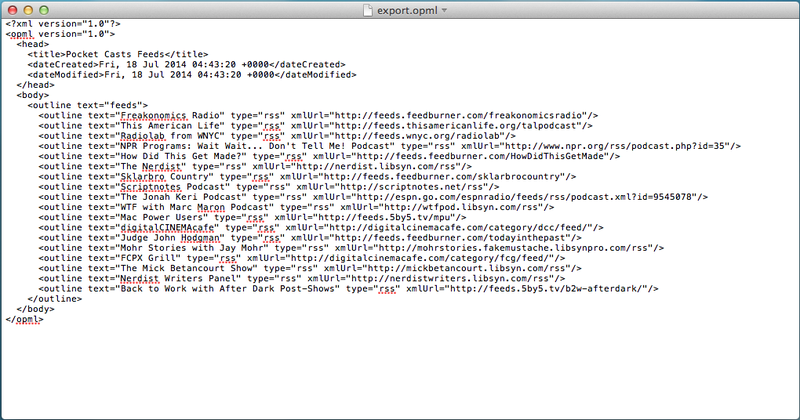 Note: This method will inform the new program what podcasts you’ve been subscribed to, but it won’t transfer other metadata, like which episodes you’ve already listened to/downloaded. See, I told you it wasn’t that interesting. So you want to get an iPad. Which one is best for you? Note: This post is just for my Mom. Seriously, she asked for my iPad buying advice, and at this point I’ve gotten better at giving tech advice in blog form than I do over the phone. Hope this helps, Ma! At first glance, Apple’s iPad line seems very un-Apple-like. Apple currently sells four different models, each with its own storage and connectivity options. Oh, and multiply all those options by two, since Apple sells everything in white or black. Put simply: Apple’s usual “good,” “better,” “best” buying options don’t really apply anymore. 1. What size screen do you want? 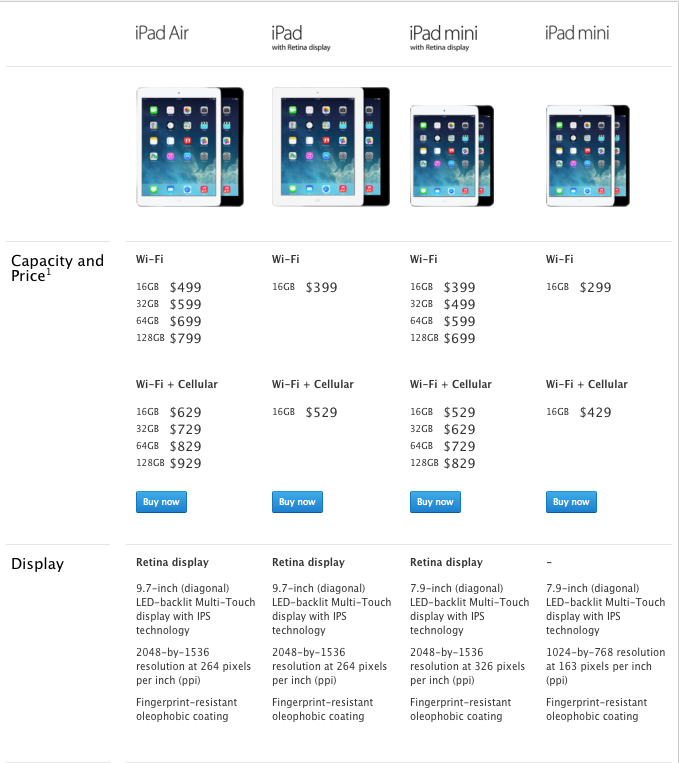 At this point, I think the iPad Mini with Retina display should be the “default” choice. It’s the perfect size for most people. Only consider the full-sized iPad Air if you know you really need the extra screen real estate. If you’re not sure that’s you, stick with the retina Mini. 2. Do you need a big hard drive? Apple offers four hard drive sizes — 16GB, 32GB, 64GB, and 128GB. Do not consider the 16GB unless you’re really strapped for cash. It’s just not big enough these days for the vast majority of people. Even if you get most of your media via cloud-based and streaming services, a typical allotment of apps plus a modest amount of the music, photos, and video you’ll want on-the-go will eat up that 16GB much too fast. The 128GB option is likewise only for a select few, and probably not you. Though 128GB is skimpy for a laptop or desktop computer, for a tablet it’s still ridiculously generous (at this time). The amount of apps, music, and photos it’d take to fill up up a 128GB tablet is more than anyone really needs access to on a regular basis. If you got the money, go crazy, but you’re either never going to use most of the space OR you’ll fill up, only to never touch more than half the stuff on there. That leaves just the 32GB and 64GB options. In my experience, 32GB is enough for most people’s needs. But if you’re at all worried about not having enough space, then 64GB is a reasonable step-up. 3. Are you okay with only accessing the internet when you’re on wifi? To get one with a cellular chip or not, that’s the question. I used to think a cell chip was worth having, because you never know when you’ll be out and about and really need internet access (and wifi isn’t an option). I no longer think that. The vast majority of people can function just fine relying only on free wifi (which is more abundant than ever). Also: Unless you want to pay extra for a monthly data plan, you’re not going to get much use from the cell chip anyway. So there you go. If you want the most reasonable option, a 32GB iPad Mini with retina (wifi-only) is a great choice for most people. Consider only a larger screen, hard drive, or cell chip only if you really think you’ll need it. PPS – As for white or black, if you really can’t choose, just flip a coin.